[T]here’s an important concept in Sikhism called Sarbat da Bhala, which means working for the welfare and well-being of all people. This is a spiritual obligation for us Sikhs. We recite these words countless times, as they conclude one of the central Sikh prayers, Ardas (meaning “petition”). Fortunately, many Sikhs are indeed embodying these words we say so often. A few months after the shooting and killing of two elderly Sikh men in Sacramento, Calif., in March, the Sacramento Sikh Temple offered a reward of $1,000 for information leading to the arrest of the perpetrator of a violent anti-gay hate attack in the same neighborhood. Twenty-six-year-old Seth Parker was punched in the face, suffering multiple facial fractures, while the attackers directed anti-gay slurs at him. The oppression of LGBT people is one of the most pervasive and accepted forms of subjugation today. Indeed, many individuals and institutions deem LGBT people a lower class or caste, justifying their discrimination with dogmatic rhetoric of what’s “natural,” “normal” and … what are true “American values.” This is no different than saying turbans are not truly American, so Sikhs should not be allowed to wear them in public. Oppression is oppression. Our struggles are intertwined. 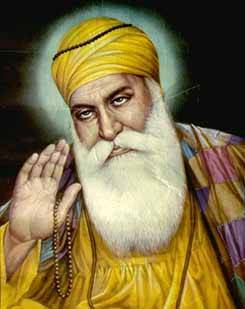 Just as Guru Nanak said hundreds of years ago, “There is no Hindu, there is no Muslim,” perhaps today we can also say, “There is no straight, there is no gay.” Indeed, his message was ultimately that we are all One. This entry was posted in Human Rights, LGBT Rights, Religion, Uncategorized and tagged gay rights, Guru Nanak, Guru Nanak Dev, Sarbat da Bhala, Sikh, Sikhism by scottlong1980. Bookmark the permalink.